Miscarriage. It’s a tough word to say, let alone to write here, but there it is. I had a miscarriage just this Pesach, and it was an eye-opening, heart-wrenching, curve-ball life experience. According to the American Pregnancy Association, anywhere between 10-25% of clinically recognized pregnancies end in miscarriage, and one in every three women will experience one. In addition, women in religious communities who have more pregnancies are more likely to experience a miscarriage, if not several. Hashem has given me a life that has been a varied road filled with many challenges as well as blessings, and that has made me no stranger to difficulty and heartbreak. I grew up on the East Coast, mostly in the South, in a large dysfunctional family that was ultimately split by a very painful divorce. I was sent to live with my grandmother, and in an effort to help minimize the burden on her, I spent my high school years balancing a nearly full-time job while finishing school. The effects of my parents’ divorce would reverberate in my family for many years with custody battles, drug and alcohol problems, as well as emotional and physical abuse. While I survived those years relatively unscathed (I see this clearly as the hand of God) I did the best I could to get as far away from my family as possible as soon as possible. So I went to college in California. It was while I was in college that I came to Judaism. I was raised a little bit Baptist and a little bit Catholic, it just depended on which parent was in a more religious mood that week. One Shabbos, I tagged along with a Jewish friend to services. With no idea what was happening for about an hour or so, suddenly the Rabbi removed the Torah from the ark, and he recited the Shema. That first time I heard the Shema, I cried. With no idea what that prayer meant, armed with a “Fiddler on the Roof” notion of what it meant to be Jewish, that first emotional Shema sent me off on a journey that led to my conversion, meeting my bashert, and starting a family. I have one beautiful and healthy daughter, thank G-d, but like anyone excited to have a family, I was ecstatic to discover that I was pregnant again. The height of my joy left me at a great height to fall into a deep pit of despair when I was told I was having a miscarriage a few weeks later. There were a series of blessings I can be so grateful for during this difficult experience: 1) My supportive husband, 2) Despite my fear of the doctor, I had the common sense to go to the doctor’s office when I was having pains, and 3) My amazing friends whom I relied on. The afternoon my doctor told me I was probably having a miscarriage, I sat in my car for a very long time. Despite the “commonness” of miscarriage, that didn’t make it any easier to experience personally. I began to pray to God for some kind of clarity as to why this was happening to me. Over the next few days, as I went back and forth to the clinic to take the blood tests that would ultimately confirm my miscarriage, I prayed and prayed. And in the midst of it all, I can’t say exactly when, through the veil of my tears, I experienced a brief moment of clarity. Hashem was testing me, I understood, and this miscarriage was a test of accepting Hashem’s will. There was nothing I could do to prevent this, all I could do was accept that it was happening. I didn’t blame the miscarriage on anything, or attempt to examine the sins I had committed in the past. I simply looked ahead. I told myself that this, for whatever reason, wasn’t the time to have another child, and that while I was waiting for that right time to come, I would focus my efforts, instead, on working on a few things inside myself. This flash of clarity was a small pinprick of hope in a cloud of pain, but it was something to hold onto as I trudged through my days. I began to focus on being present. By this I mean I tried to engage with moments of life that probably would have passed me by unnoticed before the miscarriage. I focused, for example, on enjoying small moments with my daughter, like feeding her dinner, or brushing her hair. I also engaged in deep conversations with my husband, nothing overly serious, just enjoying long chats with him that I hadn’t made time for before. I tried to cut back on the unhealthy foods I had been meaning to cut out of my diet for a long time. I’m not saying I became a whole new person. I am just saying that these small pieces of the puzzle of my life came into sharp focus, and I held onto them the way a drowning person would clutch to a life saver. The final thing I allowed myself to do was feel. This may sound obvious, but I am a very careful person when it comes to my emotions, I bury my pain deep down. As the product of a broken home and a difficult childhood, this is a coping mechanism that I learned early on, and it has taken me years to create healthy relationships because of it. Allowing myself to take a few private moments and let myself feel angry or cry was refreshing and re-energizing. I found that this emotional release helped me to cope with the rest of my day as a semi-normal and functioning person. 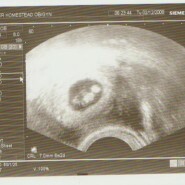 With the help of God, I look forward to having many more children. But right now, with the help of my family and friends, I am focused on healing emotionally and spiritually. With God’s help. Sarah Bracha Davidson lives in Northern California. After discovering Judaism in college, she converted and has since dedicated her life and career to working for the Jewish community. When she isn’t chasing around her darling toddler, or writing at her computer, she can be found in her non-profit organization’s office. She believes in finding miracles on a daily basis. I had an early miscarriage as well after my first child and Thank G-d I have had two beautiful daughters since. It is a secret supportive club of women I joined without knowing it was there. So many people I knew had experienced one but before I had had no idea. G-d Bless and it should be Basha Tova for myself and every woman out there. Very inspiring Sarah Bracha =-). It’s always so uplifting to see how a person can go through a personal struggle and come out with more clarity because of it. Thank you for sharing your story! Thanks Batya! I also found your recent posting very inspiring, in fact it inspired me to write this! Thank you so much for sharing. I am taking a personal growth class right now where we are talking about many of these issues. “There was nothing I could do to prevent this, all I could do was accept that it was happening” is a very powerful and helpful insight. Also, coping by pushing the pain down is what so many people do. While it can be life-saving during a crisis, eventually it loses its effectiveness and prevents people from enjoying healthy relationships. Thanks again! Wow that was beautiful. I have also had a miscarriage actually 10 , and your right it’s amazing the clarity and the will you can discover through some of the hardest times, may you go from strength to strength. I also had a miscarriage soon after I was married, and it was a difficult experience both physically and emotionally. I was very nervous during the beginning of my next pregnancy and wished I could be innocent and blithely assume all would be well. After a while I wasa able to see all the good that had come out of it – relationship-wise, etc. Also, I make sure to tell people that it happened to me (particularly to new brides) so as to keep the lines of communication open. People often don’t talk about pregnancy in the early stages, and so they may not feel comfortable talking about miscarriage. Yishar koach for sharing your story. Thank you for sharing your experience with us Sarah Bracha. I took your words to heart; not only that every experience is an opportunity for introspection and growth, but also an opportunity to give thanks for the blessings already in our lives. It is good to know that your husband and friends were there when you needed them. I hope that, given the opportunity, I too would rise to the occasion. May you experience many blessings in future.